United way of Brevard offers FREE Financial workshops to the community in Brevard. Interested in attending or setting up a workshop for your organization? Please contact Morgan Bonilla or call 321- 615-3274. Career Source Brevard - To register for workshops at Career Source Brevard please visit the website www.careersourcebrevard.com and select the date you are interested on the event calendar. United Way offers free tax prep to give you that extra boost, reduce debt, build savings and improve your finances. United Way Free Tax Prep site locations are available throughout Brevard or you may visit MyFreeTaxes.com depending on family household income. We are dedicated to helping as many community members as we can and encourage taxpayers to be wary of preparers promising faster refunds through expensive financial practices, like loans. The IRS certified volunteer tax preparers at our free tax preparation sites go through at least 15 hours of training and are certified by the IRS. We make sure our customers get high-quality, professional service from trained volunteers who are equipped to identify tax refund opportunities for customers. Tax sites will open again in January 2019. Click here to see times for 2019. Did you know that United Way volunteers prepared 2,479 tax returns for low-to-moderate income workers saving them the cost of tax preparation and helping them claim all the tax credits for which they are eligible? These efforts have an estimated community-wide impact of $2.1M. Tax refunds help working Americans put money in their pockets for everyday items and save for the future. According to a study from United Way Worldwide, about 23 percent of those asked say they spend their refunds for food, while 22 percent spend the money on housing costs; 31 percent use their refunds for utilities. One quarter of those who receive refunds put the money into savings or invest the funds for the future. 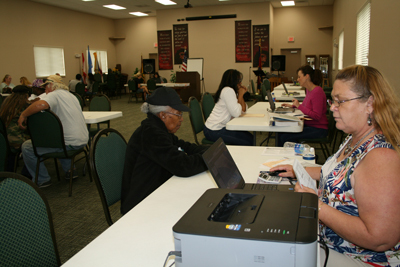 Here in Brevard, sixty-two IRS certified volunteers spent over 3,574 hours preparing taxes which collectively saved Brevard low-income residents $619,750 in fees for tax preparation services. Check out these online resources to help you improve your financial stability. These sites are packed with great information and interactive budgeting tools. Use the Spendster Calculator to find out what how daily expenditures on things you don’t really need add up and what your money’s worth. Making the most of your money starts with five building blocks for managing and growing your money -- The MyMoney Five. Keep these five principles in mind as you make day-to-day decisions and plan your financial goals. Want to take charge of your own finances and reach your goals? Just pick your age group and get started! Florida Chief Financial Officer Jeff Atwater encourages you to learn more about how to protect your hard earned money, plan for the future and avoid falling victim to various financial frauds, scams and identity theft. There are also lots of great online calculators and financial educational games for children. Build your financial know-how with free tools and information to help you make more confident decisions.